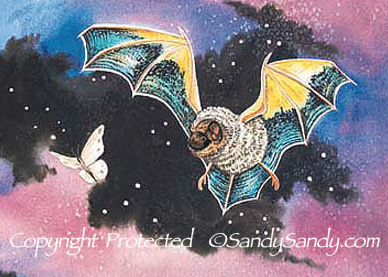 The Hoary Bats' vast range covers all of the United States as well as a large portion of Canada. These bats average between 4-6" in length and are the largest bat found in the east, with the exception of the Jamaican Fruit-eating Bat, occasionally found in the Florida Keys. Hoarys emerge later in the evening and feed mostly on moths.